Nick Dupree passed away on Saturday February 18th, 2017, at around 4:30 AM, just 5 days shy of his 35th birthday. I’m Nick, a disability rights and Medicaid reform activist, writer, comic creator, painter…. I’ve been advocating for ending the institutional bias and other long-term care reforms for years. I fight especially hard for awareness and action on issues that affect those of us who, like me, have complex care needs and are vent-dependent. We are a vulnerable population that spans multiple diagnoses and every age group, and, to stay in our homes and communities, we need change in long-term care. I was born with a super rare metabolic disease, as was my younger brother Jamie. I’ve been on various forms of life support since age 9 when an infected surgical site—the destructive Luque rods surgery occurring on Friday, September 13th, 1991—triggered a crash, a “metabolic domino effect” that killed what little muscle tone I’d had previously. I got my first feeding tube in October 1991, my first vent in February 1992 (full-time BiPap) then was trached and vented in November 1994. I grew up in and around the Spring Hill College campus in Mobile, Alabama, where I studied from Fall 1998 when I entered at age 16, until 2005. The Jesuits’ social justice teachings heavily influenced me. I’m most known for my two-year campaign to change Medicaid in Alabama, dubbed “Nick’s Crusade.” It has, I hope, created a positive ripple effect. Then, as now, states were required to care for kids, but once you hit age 21 (too often) you’re cut off. I call it Medicaid’s 21 cut-off. “Aging out” of home care needed to survive and thrive, have a life and stay outside of institutions, though widely ignored, is an ongoing defect in our system that’s actively harming people who are usually the least equipped to bribe lobby the powers that be, to speak out. So much preventable harm is not prevented because the state Medicaid system (in whichever state you’re in, varying wildly) is so purposefully bare bones or too slow to adapt. That someone died due to their home care getting yanked because of an arbitrary age cut-off, the 21 cliff , in America, in the 21st century, should shock you. It points to a broken gov’t, broken health care models, broken state-to-state Medicaid systems, broken nonprofit sector, broken ideologies that do not account for the realities of human frailty, disability, chronic illness and what these really mean day-to-day, the sheer funk and squishiness inherent to mankind, political brokenness in the South, and a deep spiritual brokenness and hardness of heart writ large. I agree with certain religious thinkers on the Right that America needs a change of heart not just a change of regime, not just more funding for X, Y, Z, but insist care for the most disabled be expected in any virtuous system. I want the meanness of spirit that’s spread like a virus to change first and foremost, and for the concept that we are all images bouncing from the same prism, we are all tentacles of the same divine octopus, to replace the hate. In the Southern states, long-term care in the home, and more broadly, Medicaid—the only source of such care for most people—is more hotly disputed than in the North. To put it mildly. 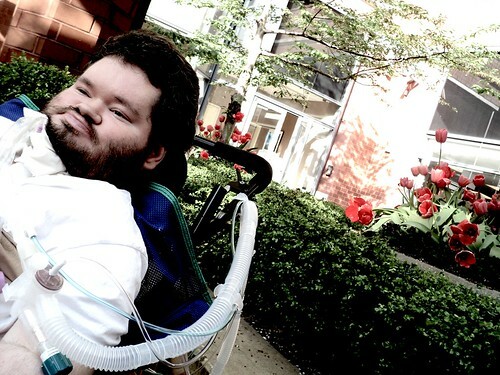 Alabama Medicaid Agency had no plan for continuing home care for people beyond age 21, even for the most severely disabled ventilator-dependent Alabamians. By January 2001, too many other vent-using young adults had already received their bloodless form letter or slip with computer code from Montgomery announcing the “termination” of their life-sustaining care, and had “aged out” of federally-mandated EPSDT care, and been dropped by home care just for turning 21, put in awful positions. Seeing the writing on the wall, I launched “Nick’s Crusade” in March 2001 soon after my 19th birthday. I appeared in the following WPMI-TV Mobile, AL local news feature “Nick’s Crusade” August 2nd, 2001. Another story on WPMI aired autumn 2002, Bruce Mildwurf reporting on what happened to the Morris family after Alabama Medicaid arbitrarily ended care for Patrick, who has Duchenne’s MD and depends on a ventilator to breathe too, when he turned 21. Nonetheless, the Alabama legislature balked at any proposals to deal with the 21 cut-off problem. Medicaid’s legislative liaison had home field advantage in Montgomery, up and down the halls of power week after week vs. my infrequent visits up I-65, and she constantly lobbied the relevant committees not to spend on home care, touting ridiculously inflated cost estimates. The proposed Nick Dupree Adult Care Act never made it onto the Alabama Senate floor. No action was taken. The reprieve for me, (younger brother) Jamie, and future vent-dependent Alabamians reaching 21 came not from the politicians, but from newly appointed federal Judge Mark Fuller, who compelled Alabama Medicaid to fix the issue. On February 10, 2003, U.S. HHS secretary Tommy G. Thompson announced approval of Alabama Medicaid’s waiver program that’d fund in-home services for 30 vent-dependent people hitting the 21 cliff in the future. After the feds quickly greenlit the program—the uncharacteristically speedy end to the labyrinthine CMS waiver approval process coming largely thanks to the committed efforts of Mobile’s then-U.S. House Rep. Jo Bonner—it was kicked back down the line to Medicaid in Montgomery, and they had to iron out the details and the implementation. They eventually did… at the 11th hour before I turned 21 on February 23rd, 2003. The program has since expanded to help more people, but initially only covered me. The TA (Technology Assisted) Waiver was created for the care of Alabamians on mechanical ventilation, and endures, as do we. My advocacy and eventual plea in federal court in Montgomery led to local and national coverage of my fight to maintain a life outside of hospitals and other institutions, and the fights of others on vents. Independence from institutional models of care remains so important, socially, spiritually, medically, in every area. Though it can be extremely difficult maintaining in-home care day-to-day, staying healthy and in the community is pivotal. I continue advocating for those of us, who, like me, have complex and intensive needs, to be allowed the in-home support necessary to stay out of high-risk hospital settings. People misunderstand… I was talking survival, and they were talking rights, independence, more abstract concepts. Community is survival. The greater the medical needs, the greater the necessity to hold fast to kith and kin, to have a circle of support protecting and looking out for you. Since August 28, 2008, I’ve lived in New York City alongside/with my partner Alejandra – first, in Coler-Goldwater state rehab hospital (for 378 days), and later, at home in our community. I have continued creating both fiction (online comics I paint with the trackball mouse, such as Theodore Roosevelt and the Rough Riders vs Zombies, and Bunnies in Space) and nonfiction (essays on history, politics, and health care). One of my essays, on the impact of cuts in the federal budget and universal health care as a human right, was published as part of Greenhaven Press’ reference volume Health Care: Opposing Viewpoints in 2008.